The only sea I saw Was the seesaw sea With you riding on it. Lie down, lie easy. Let me shipwreck in your thighs. Poetry is not the most important thing in life... I'd much rather lie in a hot bath reading Agatha Christie and sucking sweets. [I'm]a freak user of words, not a poet. These poems, with all their crudities, doubts and confusions, are written for the love of man and in Praise of God, and I'd be a damn fool if they weren't. I believe in New Yorkers. Whether they've ever questioned the dream in which they live, I wouldn't know, because I won't ever dare ask that question. Two of them were Welsh Nationalism. In spring 1936 Thomas met Caitlin Macnamara (b. 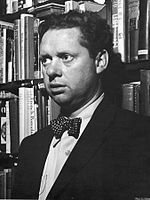 Although writing exclusively in the English language Thomas has been acknowledged as one of the most important Welsh poets of the 20th century. Thomas died on 9 November 1953 and his body was returned to Wales where he was buried at the village churchyard in Laugharne. In the 1950s Thomas travelled to America where his readings brought him a level of fame though his erratic behaviour and drinking worsened.